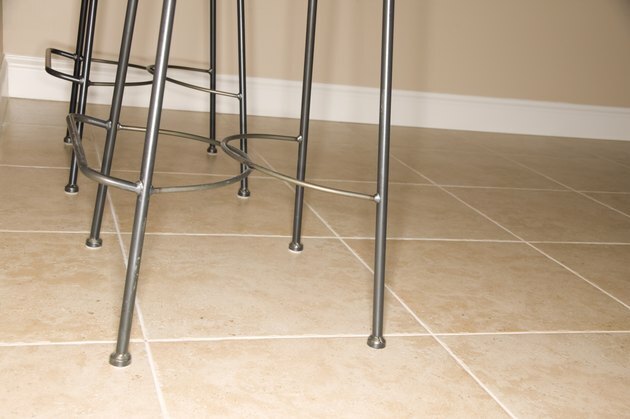 For fast installation of tile on different floor surfaces, opt for peel and stick tiles. The tiles contain a thin layer of adhesive that firmly sticks to sub-flooring materials. Instead of laying down glue, you simply remove the paper backing and stick the tile to the floor. You can glue down peel and stick tiles, but you must use caution when adding an additional layer of adhesive. Peel and stick tiles come in dozens of different designs. Peel and stick tile only contains as much adhesive as the manufacturer deems necessary. The glue is not as strong or durable as a separate tile adhesive. Over time, you might notice that the tile starts peeling away from the flooring. You also risk air bubbles forming under the tile, especially if you do not properly smooth down the tiles during the installation process. Water or moisture can also seep under the tiles, pushing through the adhesive, which causes the tiles to peel away. When you use extra adhesive, you must apply a glue specifically designed for tiles on a clean and dry floor. The adhesive must sit for 15 minutes or longer. Try lightly touching the top of the glue. If it feels slightly sticky or tacky, the glue is ready. If the tile still feels wet or sticks to your hands, let it sit longer. Place each tile flat on the adhesive and rub out any air bubbles. As you arrange the tiles, place the pieces side by side, limiting the amount of space between each tile. Always check the recommendations of the manufacturer before using extra glue on the peel and stick tiles. Not all tiles work with additional glue. You risk the new adhesive reacting negatively with the glue on the tile backing, which will cause a breakdown of the adhesive. When the glue breaks down, it loses its sticking ability. You also risk using too much glue, which causes it to seep out from the edges of the tiles. Using the wrong type of adhesive can weaken the tiles themselves or, with thinner tiles, make the glue lines appear through the top. If you want the look of peel and stick tiles, but with more durability, opt for lightweight, thin tiles used with traditional tile adhesive. The thinner tiles mimic the look of peel and stick designs, but are more durable and last longer. Though the installation does take longer, it reduces the chances of the tiles coming loose in the future.